Gillette has always worked hard to perfect their high-quality razor lineup. Their newest upgrade, the Fusion ProGlide, is more than just a deluxe version of the Fusion. The ProGlide adds in new changes to make the excellent shaver glide even more smoothly than before. For anyone who doesn’t know the Fusion shavers well, Gillette’s brand uses five blades to thoroughly trim facial hairs down to size. They also include a sideburn trimmer on the back, so that people can remove thicker hairs without a problem. The company labeled this new feature as “fusion technology.” This technological name was more or less made just to counter against Schick’s Quattro razors, which used four blades. As silly as the name sounds, it helped Gillette’s Fusion gain acceptance as one of the top razors in the market. Despite a few complaints that the Fusion was not much different than Gillette’s previous Mach 3 razor, it still received very favorable reviews. The ProGlide continues the Fusion line of five-blade razors by making numerous modifications to the head. The leading blades are now thinner and the lubricating strip is thicker. Although these changes are only fractional improvements, they help the shaver glide more smoothly across the skin. The head also has a microcomb inserted in front of the blades. This small comb straightens facial hairs so that the shaver can cut them off cleanly. This little feature especially helps to trim off any curly hairs on the chin or the sides of the face. 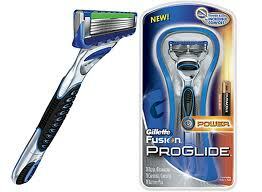 Gillette also sells a fancier version of this razor, known as the ProGlide Power. The main difference between the two is that the Power uses a battery to add micropulses to a person’s shaving stroke. This allows a person to glide the blade even more cleanly across the face. Despite what cynical shoppers may think, this is not a gimmick. The micropulses actually help to reduce the razor’s drag along the face. The shaver also has a handy low battery indicator light to notify people when they have to change the battery. It can also automatically shut off the power if the razor is left on accidentally. If all this isn’t enough, men could try out the newest model, the ProGlide Styler. This product isn’t just a razor–it also includes trimming technology from Braun.M en can remove the shaver head of the device to use the styler head underneath. This combination allows this new razor to act as a shaver, a trimmer and an edger. Although no one has thoroughly reviewed the ProGlide Styler, it could become the best model of the Gillette’s Fusion brand. Advertisements for the razor even include celebrities such as Adrien Brody, Andre 3000 and Gael Garcia Bernal. Gillette is clearly aiming to promote its razor as the best in the market. Before shoppers buy a ProGlide, they should know that the replacement blade cartridges for the Fusion shavers are not cheap. The current list price for an eight-pack of cartridges is about $50. Amazon.com has a lower price at about $28, but this still is a really expensive razor to maintain. If men are willing to pay the price though, the ProGlide may become one of the best shavers in their collection. The Fusion ProGlide has already received rave reviews from many publications. Based on the exquisite quality of this razor, the ProGlide is hard to beat.